New Haven, Conn. – Yale researchers have found that a type of air pollution is much more complicated than previous studies indicated. For the study, published Nov. 2 in Nature's Communications Chemistry, the researchers used a combination of liquid chromatography, which separates thousands of compounds in a sample, and a mass spectrometer, which identifies and analyzes those compounds. "Here, we can actually differentiate molecules that would otherwise appear to be very similar," said the study's senior author, Drew Gentner, assistant professor of chemical & environmental engineering. "In past studies, they had less information on molecular identities across the complex mixtures present. With these instruments, we can determine molecular formulas with more accuracy." That's a significant advancement, the researchers note, since knowing what harmful elements are in the air is critical to finding ways to reduce them, added Gentner. 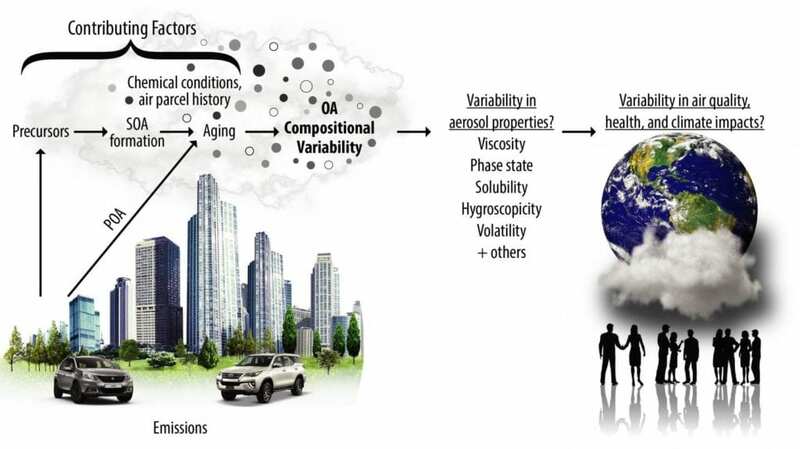 "If you develop an air pollution control policy based on less specific information for organic aerosol, there may be much more variability in the molecular-level composition than you might expect, which could influence aerosol properties and impacts," said Jenna Ditto, a Ph.D. candidate in Gentner's lab and lead author of the study. Even if certain causes remain constant, the researchers said, a number of factors could be driving the variability. "The different types of compounds emitted from cars and plants could vary from car to car or tree to tree," Ditto said. "There's a wealth of information in these details for the field to use," Gentner said. "There's valuable data that you can capitalize on to understand what's happening in the whole complex system."